Just back from a short and refreshing trip to Delhi.Delhi can also be called as our food capital…it has so much variety of food to offer a traveler…Momos,Ram ladoos, Chats,Parathas,Tandoori, Mughlai……the list is endless . 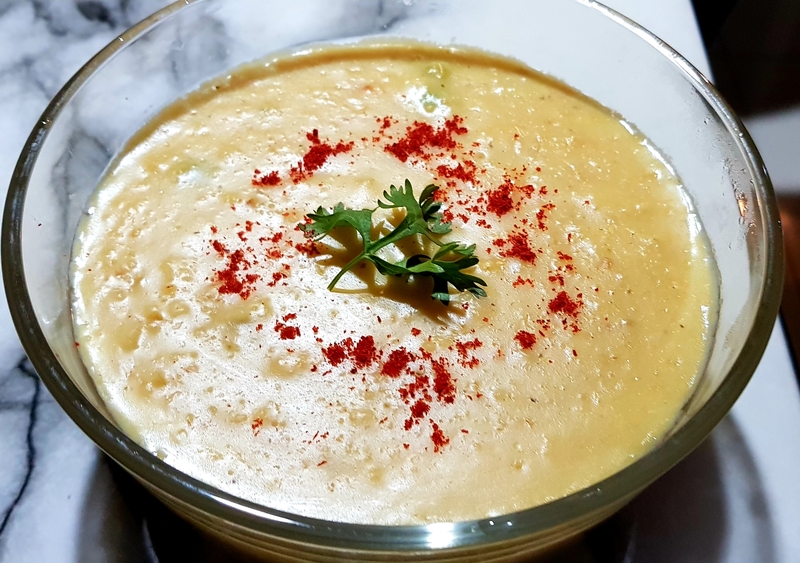 So after this gastronomical experience wanted to make something simple but tasty….so tried my hands on this vegetable oats and mung dal khichdi..
It’s almost same as our humble dal rice khichdi,here rice is replaced with oats…and the recipe needs some extra water to get the right consistency . 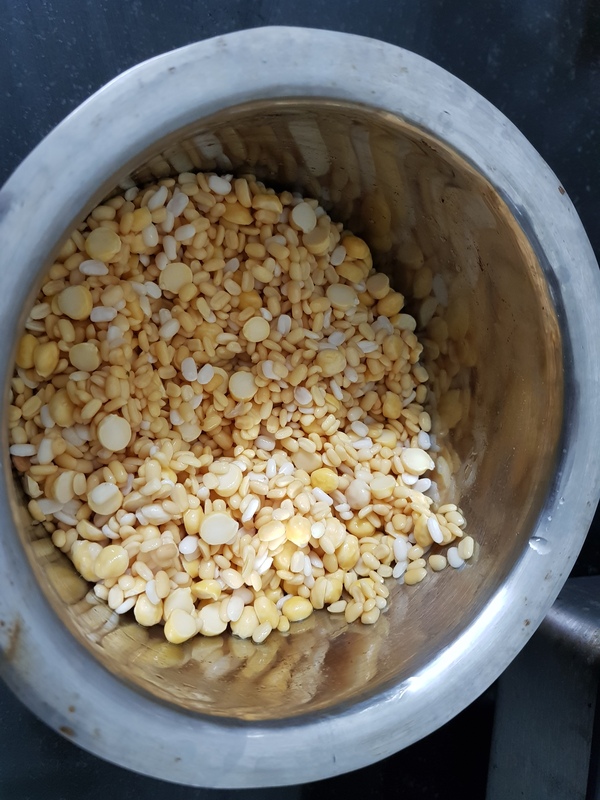 I love my khichdi’s consistency to be semi solid,if you want you can lessen the quantity of water and make it more like pulav,also tempering can be added. 1 Medium sized Tomato chopped. 1 tbsp Ginger and Garlic finely chopped. 2 Green chillies finely chopped. 1 tbsp chopper Corriander leaves. Heat 1 tbsp ghee in a cooker or pressure pan,add chopped ginger and garlic,saute for a minute and add green chillies and onion.once onion turns translucent add chopped tomatoes, mix well and cook for 2 minutes. Now add haldi powder and chilli powder, fry for a while, add 2 tbsp of water and let it cook for 2 minutes. 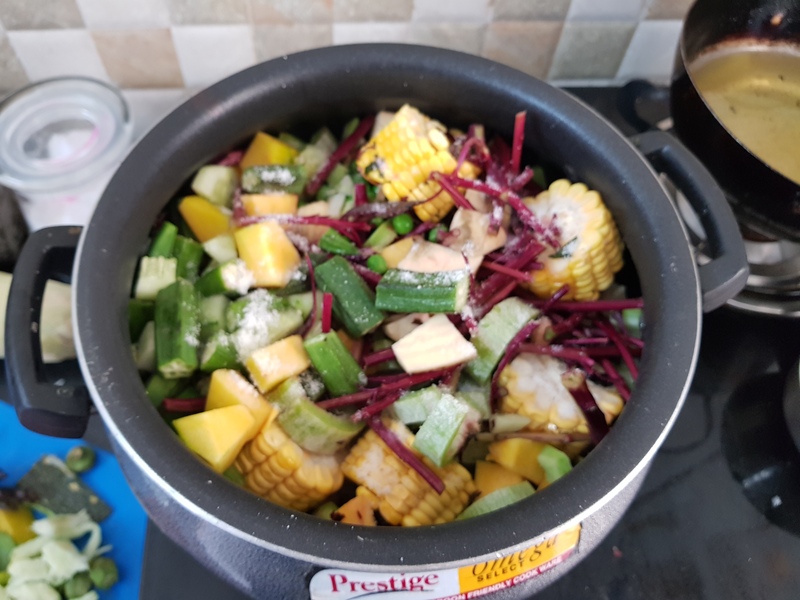 Add chopped vegetables,drained dal and oats,add salt.Mix well and saute for 2 minutes. Add 4 cups of boiling water,mix well and cook on high for 3 whistles and on low for another 2 whistles. Open the cooker after the pressure is realised,mash well with back of the spoon. Sprinkle some red chilli powder and garnish with chopped Corriander leaves. Remove in a serving plate and serve hot with pickle and papad. One should bake up something for every occasion. Celebrate a birthday ,festival, achievement, success…anything..by baking a stunning cake. For me baking is a therapy ! Here goes this simple foolproof cake recipe…..
Few drops Yellow,Green and Rose Red Colour. Grease baking tin with melted butter,here I have used bread loaf tin. Sieve together flour and baking powder thrice. Cream butter and sugar with electric blender till it becomes light and fluffy. Add egg one at a time,continue beating. Add little milk if required. 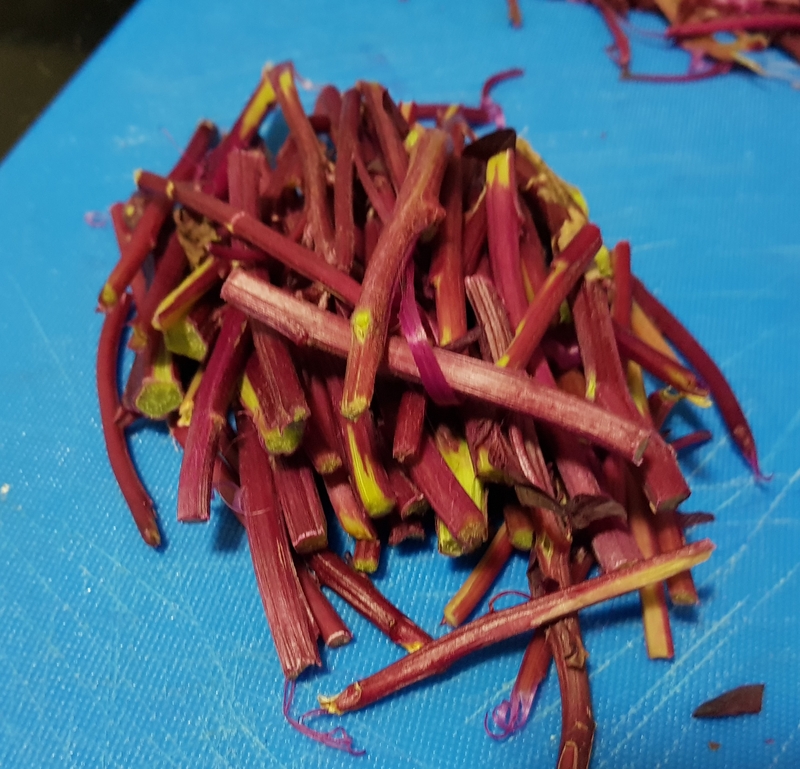 Divide in 3 parts.Add colours to each part separately,mix well. Add batter to tin,one on top of other,swirl a knife through the batter for effect. Bake at 180degreeC for 30 to 35 minutes. Remove from tin and let it cool completely. Cut into pieces and serve.Can be stored in airtight container up to 5 days. 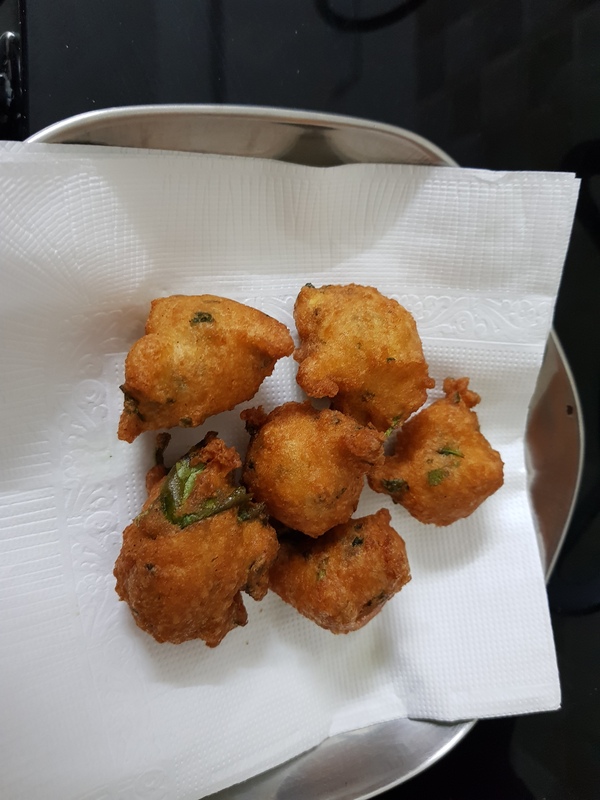 Ram Ladoos as known on streets of Delhi are actually mix dal bhajias,(mixed Lentil fritters).They are crispy and crunchy. This is a favorite street food of Delhi- Ram Ladoo or Gul-gulle. 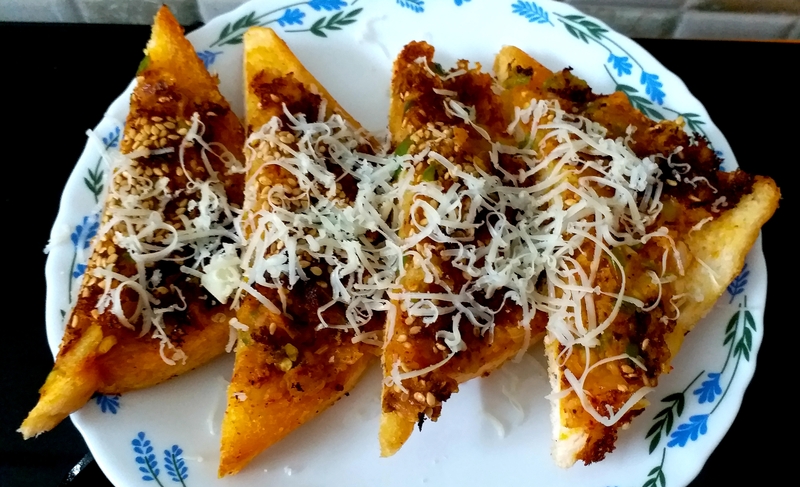 Just like Chole Bhature, and Matar Kulcha, this is another yummy delicacy from Delhi. when you are in Delhi, you can’t miss on this one. You will see vendors on their mobile stalls,selling these tempting ladoos dipped in chutneys and topped with shredded radish in every famous shopping place like Lajpat Nagar, Chandi Chowk…..
Ladoos, on their own, are not spicy. The flavor comes from the chutneys and spices that top these Ram ladoos. 2 tbsp Coriander leaves, finely chopped. In a large bowl soak moong dal, chana dal and udad dal for 6 hours. Now drain the water and grind the dal in a mixie along with ginger and green chillies. Without adding water. 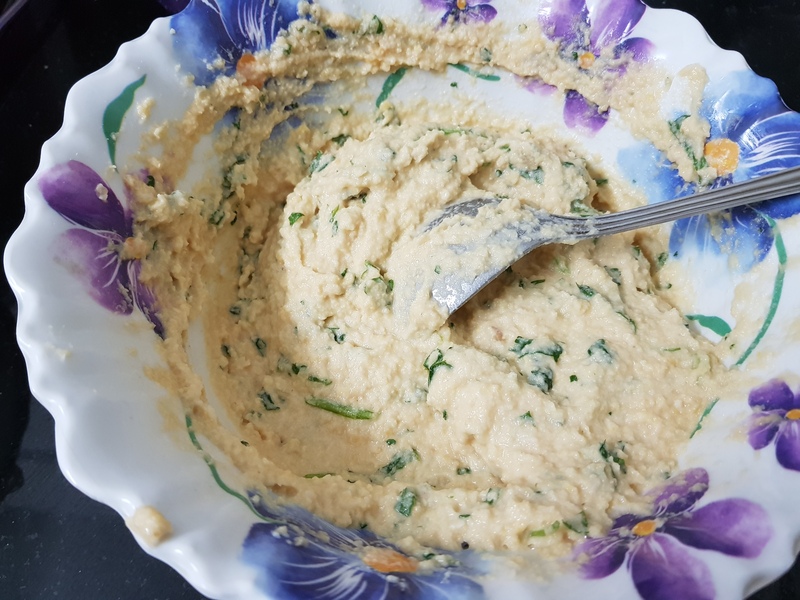 Remove the prepared batter in a mixing bowl. Add jeera,Asafoetida, salt ,chopped coriander leaves and baking soda/Eno. 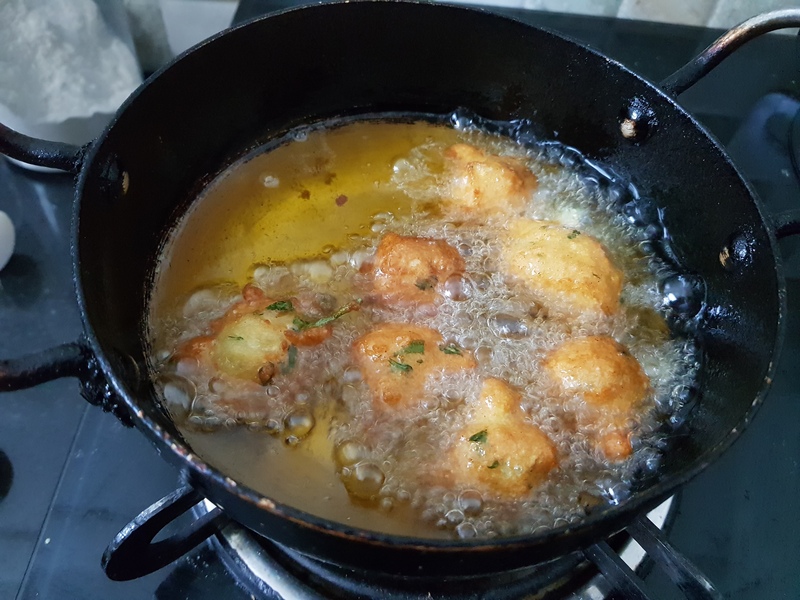 With wet hand start dropping one by one ladoo to hot oil.fry on medium heat till golden brown. Once done remove on absorbent paper. 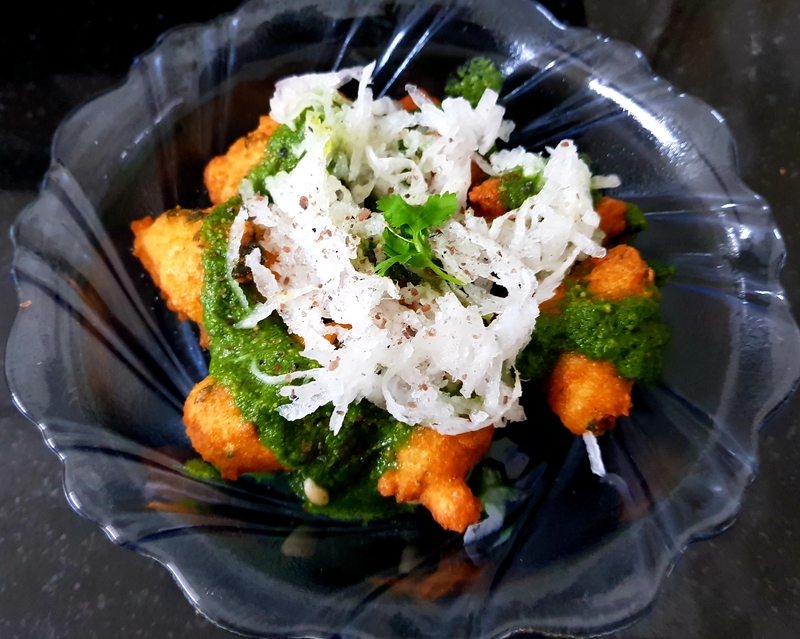 Place 5 to 6 fried ladoos into the serving bowl,top with some mint chutney and tamarind chutney. Sprinkle some chopped coriander leaves, grated radish and a pinch of chat masala. 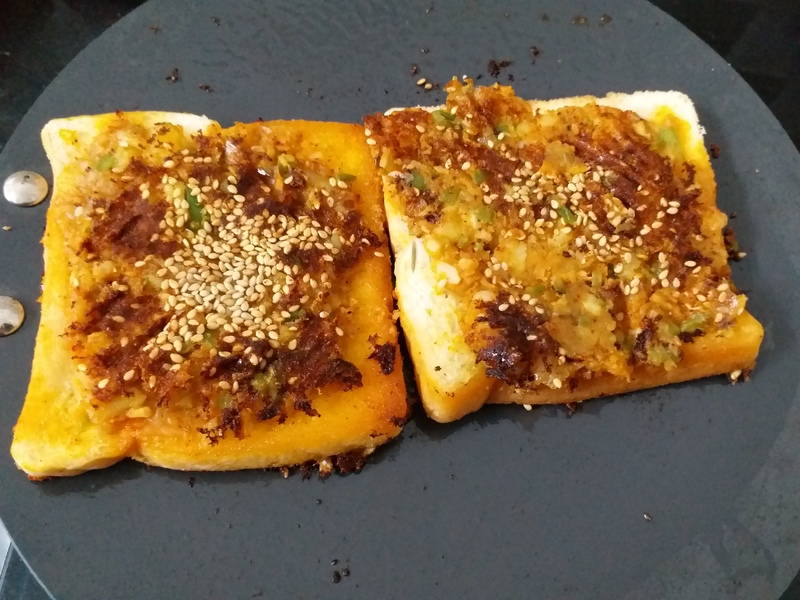 This one is made using malvani masala,is bit spicy ans very flavour full.Malvani masala is easily available in market.Each malvani family has its own specific recipe for the same. Here i have added potato,even green peas can be added to this recipe.Goes very well with Bhakri or chappati. 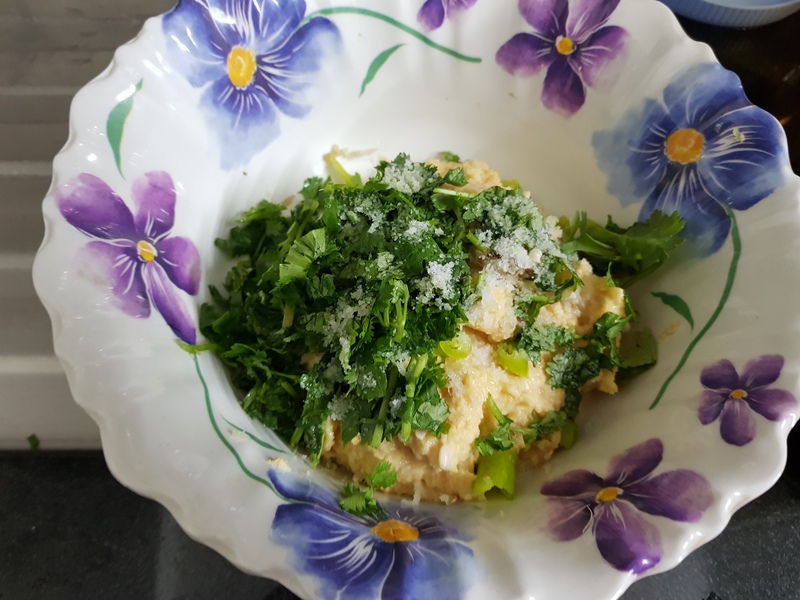 1 cup Cauliflower cut into small peices. 1/4 cup Potatoes, peeled and thinly sliced. 2 tbsp chopped Corriander leaves. 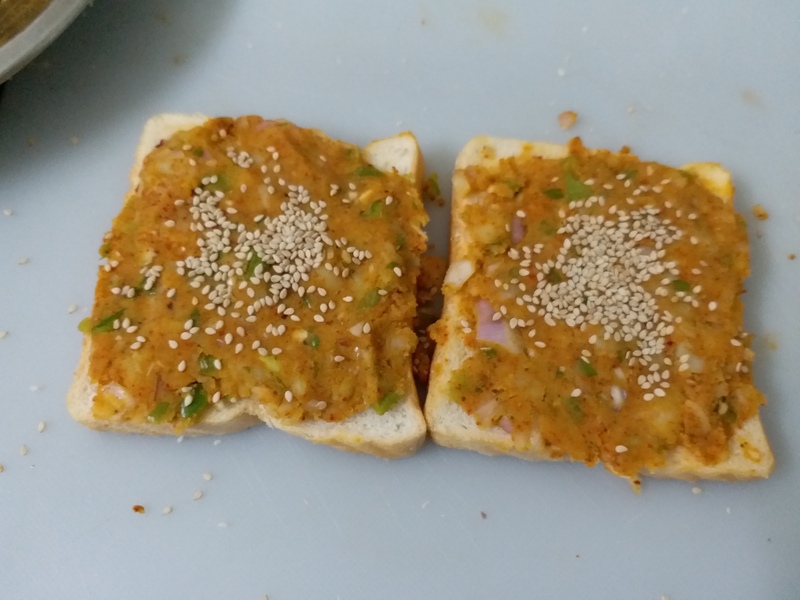 In a pan heat oil,add mustard seeds and Asafoetida. Add chopped garlic and cook till it turns golden brown. 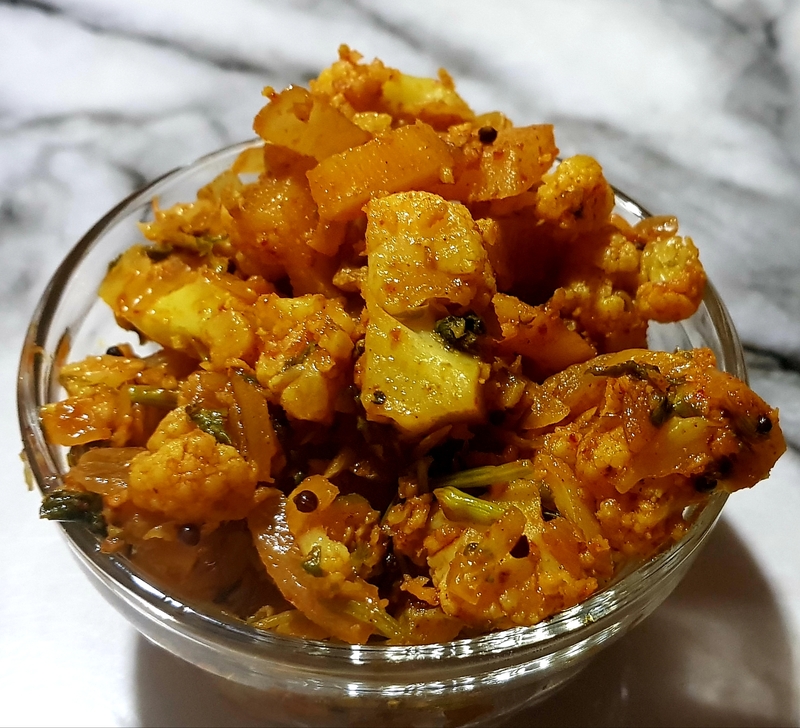 Add chopped cauliflower and potatoes,makvani masala,haldi powder and salt.Mix well.sprinkle little water,cover and cook for 5 to 7 minutes or till the vegetables are cooked. 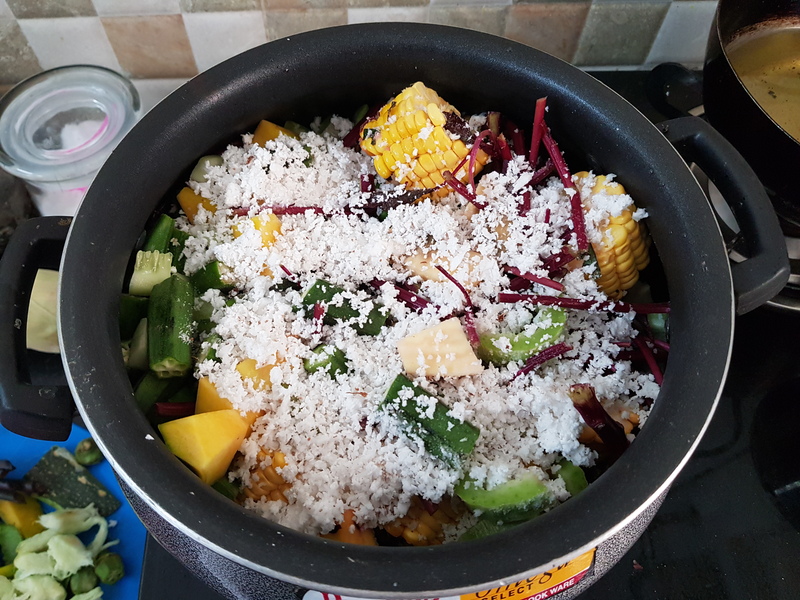 Add grated coconut and choppef Corriander leaves.Mix well. Serve hot with bhakri or phulkas. 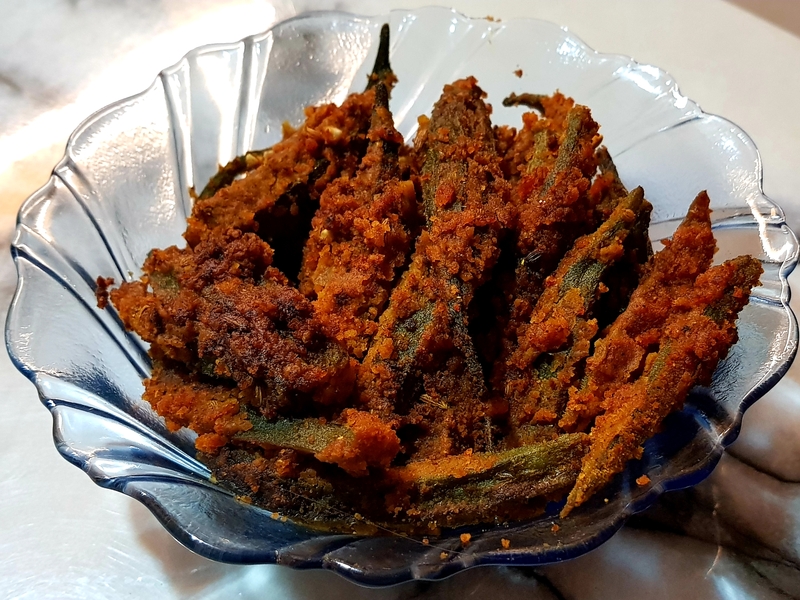 Bharwa bhindi is a side dish in which Bhindi (Okra / Lady Fingers) are stuffed with a tangy and spicy masala filling.Bhindis are mild in taste so their taste gets enhanced when filled with this flavour full stuffing.This dish goes well with phulkas or even plain dal rice. 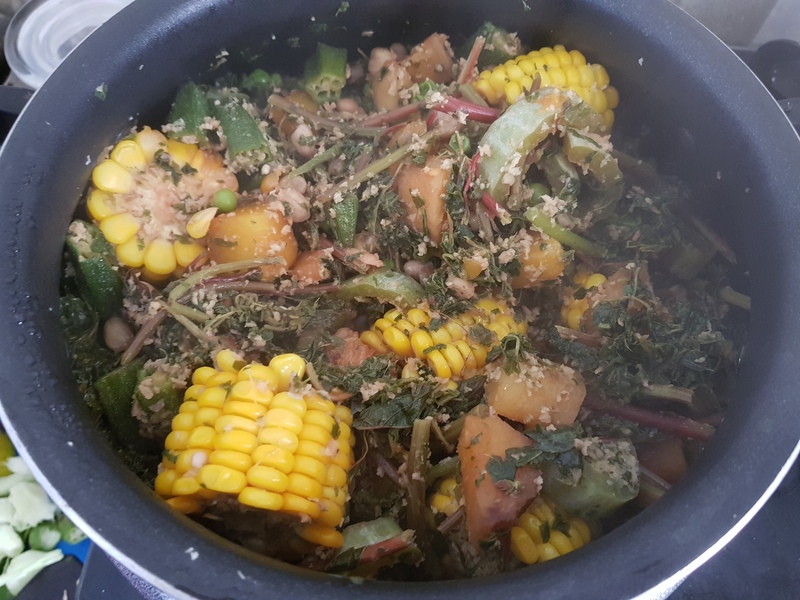 Same stuffing can be used to stuff karela,tendli,bhavnagri mirchi or baby potatoes. 500 gm Bhendi (Okra),cleaned and slit lengthwise. In a plate take roasted besan and all the dry masalas,salt and sugar. Clean and pat dry bhendis.give a slit lengthwise. Fill the prepared stuffing in bhendis. In a pan heat oil,arrange stuffed bhendis,sprimkle remaining masala on top,cover and cook for 2 minutes. with light hand turn the bhendis and again cover and cpok for another 5 mins. Once done remove in servimg bowl ans and serve hot with chapatis. 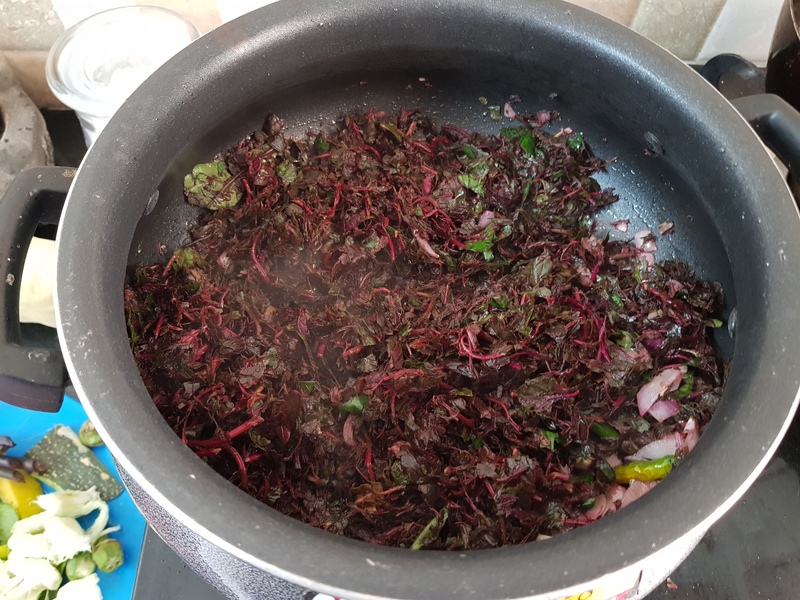 In Maharashtra this simple vegetable,is made on Rishi Panchami. Rishi Panchami is the fifth day, the next day after Ganesh Chaturthi in Bhadrapad month of the Lunar calendar. It is a traditional worship day for Sapta Rishi. 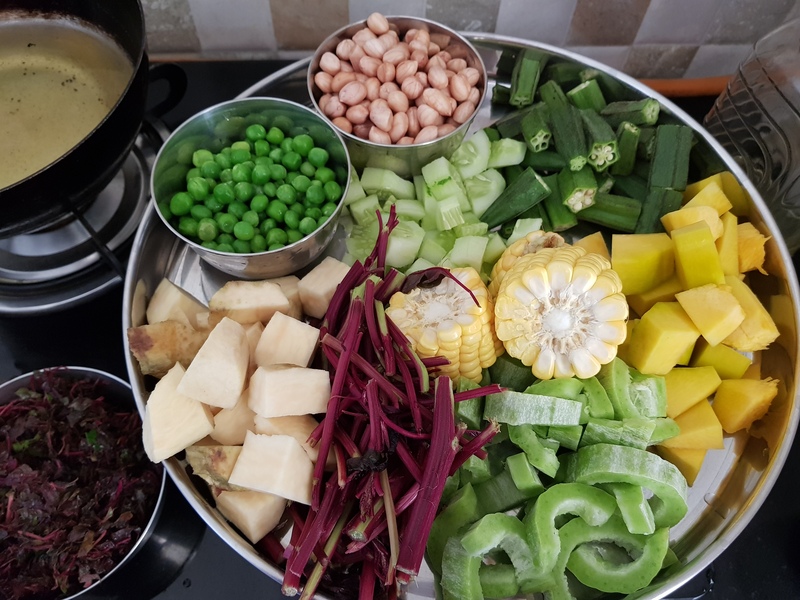 This vegetable is made using seasonal vegetables and tubbers .The vegetables that are used are the ones where ox is not used for the farming. 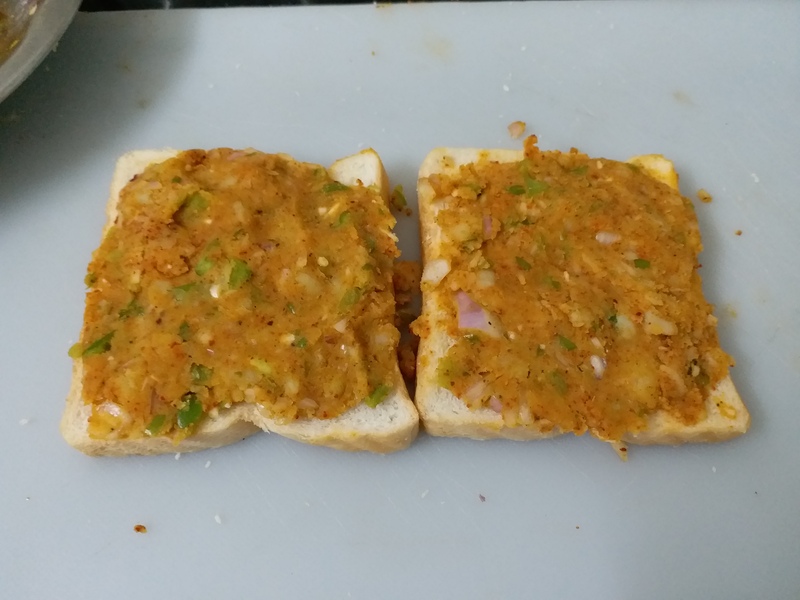 It is also cooked in simple way without adding any spices as cooked by rishis….hence the name “Rishi Chi Bhaji”. 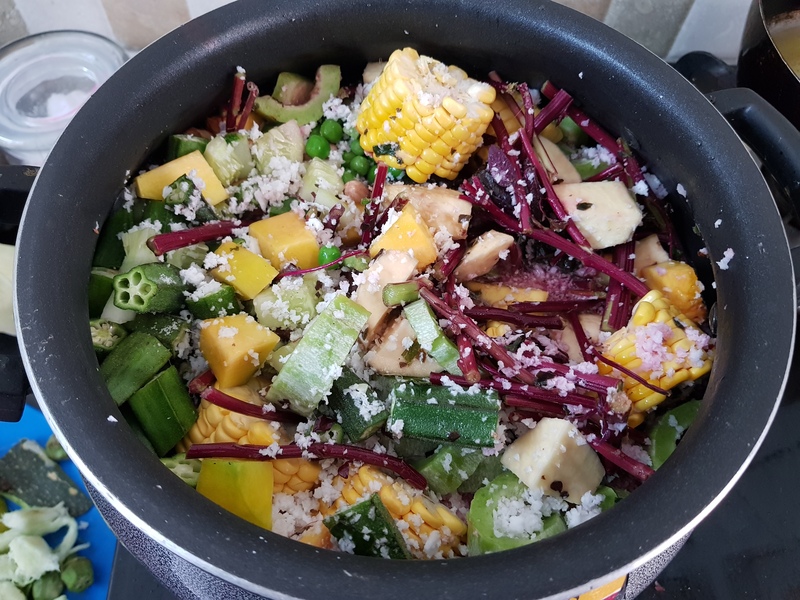 Time consuming recipe as lots of vegetables needs to be cleaned and chopped….But the taste is worth every effort. 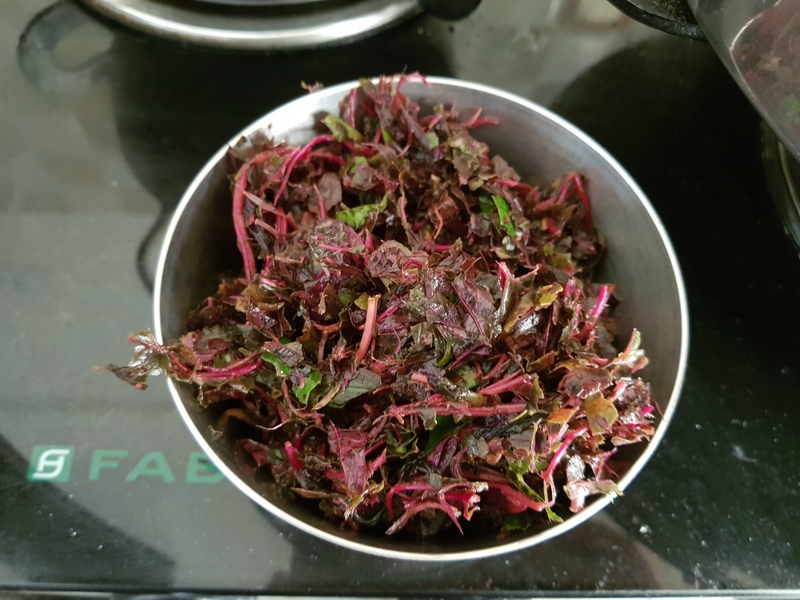 2 cups Lal Math (Amarnath ) leaves with tender stems, washed and chopped finely. 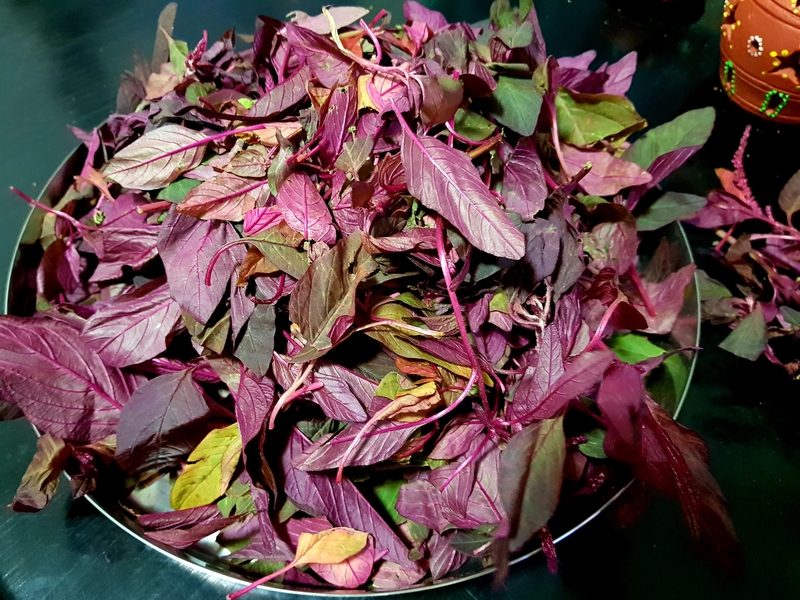 1 cup Aloochi paan/ Colocasia leaves with tender stems, washed and chopped finely. 1 cup Stems of Lal Math washed,peeled and cut into peices. 1/2 cup, Padwal (snake gourd)chopped. 1/2 cup,Lal Bhopla (Red pumpkin ), peeled and chopped. 1/2 cup Bhindi ( Lady’s finger )Chopped. 1/2 cup Kakdi (Cucumber) peeled and chopped. 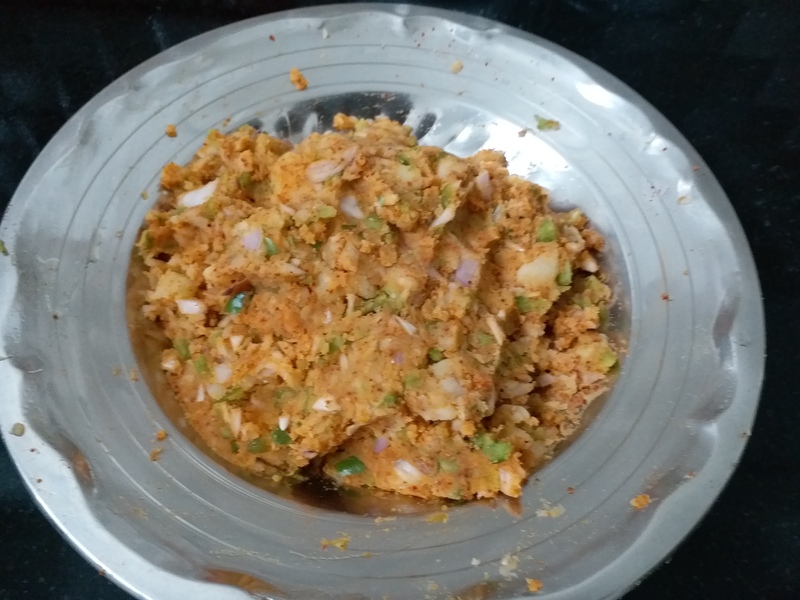 1/2 cup Ratalu (Sweet Potato)peeled and chopped. 1/2 cup Raw peanuts soaked for 2 hours. 6 peices of tender Corn on cab. 1/2 cup coconut, freshly grated. 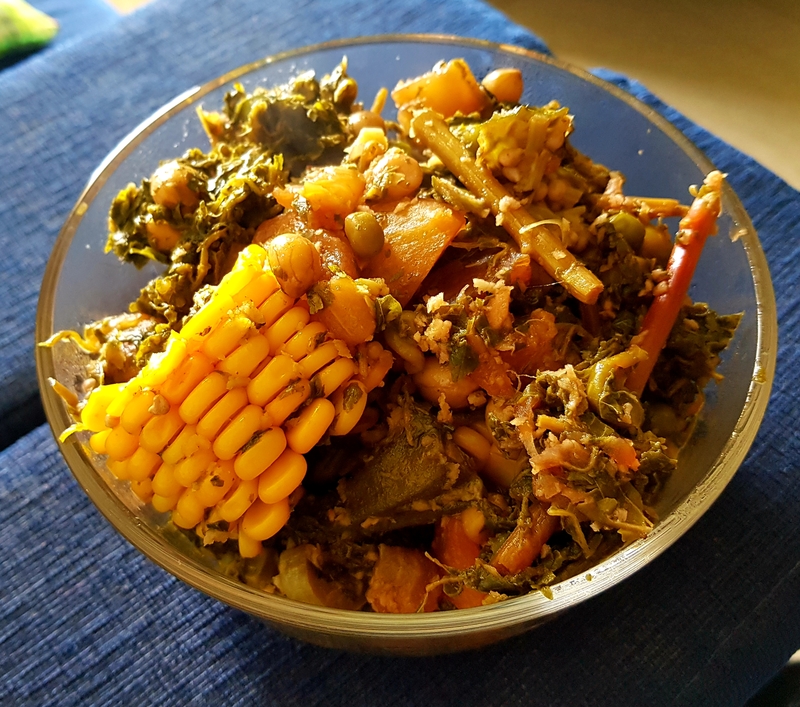 Add chopped green chillies,followed by chopped leafy vegetables .Mix well and add all the remaining vegetables. Add salt and grated coconut . Add 2 cups of water.Mix well with light hand. Cover and cook for 25 to 30 minutes ,stirring lightly in between. Check if all the vegetables are cooked. Add tamarind pulp and jagery. Remove in serving bowl and serve hot with puri or bhakri.